The Nile Delta (Arabic: دلتا النيل‎ Delta n-Nīl or simply الدلتا ed-Delta) is the delta formed in Northern Egypt (Lower Egypt) where the Nile River spreads out and drains into the Mediterranean Sea. It is one of the world's largest river deltas—from Alexandria in the west to Port Said in the east, it covers 240 km (150 mi) of Mediterranean coastline and is a rich agricultural region. From north to south the delta is approximately 160 km (99 mi) in length. The Delta begins slightly down-river from Cairo. The Nile Delta is an area of the world that lacks detailed ground truth data and monitoring stations. Despite the economic importance of the Nile Delta, it could be considered as one of the most data-poor regions with respect to sea level rise. From north to south, the delta is approximately 160 km (99 mi) in length. From west to east, it covers some 240 km (150 mi) of coastline. The delta is sometimes divided into sections, with the Nile dividing into two main distributaries, the Damietta and the Rosetta, flowing into the Mediterranean at port cities with the same name. In the past, the delta had several distributaries, but these have been lost due to flood control, silting and changing relief. One such defunct distributary is Wadi Tumilat. The Suez Canal is east of the delta and enters the coastal Lake Manzala in the north-east of the delta. To the north-west are three other coastal lakes or lagoons: Lake Burullus, Lake Idku and Lake Mariout. 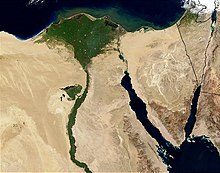 The Nile is considered to be an "arcuate" delta (arc-shaped), as it resembles a triangle or flower when seen from above. Some scholars such as Aristotle have written that the delta was constructed for agricultural purposes due to the drying of the region of Egypt. Although such an engineering feat would be considered equivalent to a wonder of the ancient world, there is insufficient evidence to determine conclusively whether the delta is man-made or was formed naturally. In modern day, the outer edges of the delta are eroding, and some coastal lagoons have seen increasing salinity levels as their connection to the Mediterranean Sea increases. Since the delta no longer receives an annual supply of nutrients and sediments from upstream due to the construction of the Aswan Dam, the soils of the floodplains have become poorer, and large amounts of fertilizers are now used. Topsoil in the delta can be as much as 21 m (70 ft) in depth. People have lived in the Delta region for thousands of years, and it has been intensively farmed for at least the last five thousand years. The Delta used to flood annually, but this ended with the construction of the Aswan Dam. 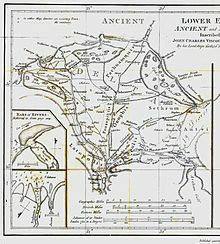 There are now only two main branches, due to flood control, silting and changing relief: the Damietta (corresponding to the Phatnitic) to the east, and the Rosetta (corresponding to the Bolbitine) in the western part of the Delta. The Rosetta Stone was found in the Nile Delta in 1799 in the port city of Rosetta (anglicized name of Rashid). The delta was a major constituent of Lower Egypt. There are many archaeological sites in and around the Nile Delta. About 39 million people live in the Delta region. Outside of major cities, population density in the delta averages 1,000/km2 (2,600/sq mi) or more. Alexandria is the largest city in the delta with an estimated population of more than 4.5 million. Other large cities in the delta include Shubra El Kheima, Port Said, El Mahalla El Kubra, Mansura, Tanta, and Zagazig. During autumn, parts of the Nile River are red with lotus flowers. The Lower Nile (North) and the Upper Nile (South) have plants that grow in abundance. The Upper Nile plant is the Egyptian lotus, and the Lower Nile plant is the Papyrus Sedge (Cyperus papyrus), although it is not nearly as plentiful as it once was, and is becoming quite rare. Several hundred thousand water birds winter in the delta, including the world’s largest concentrations of little gulls and whiskered terns. Other birds making their homes in the delta include grey herons, Kentish plovers, shovelers, cormorants, egrets and ibises. Other animals found in the delta include frogs, turtles, tortoises, mongooses, and the Nile monitor. Nile crocodiles and hippopotamus, two animals which were widespread in the delta during antiquity, are no longer found there. Fish found in the delta include the flathead grey mullet and soles. The Delta has a hot desert climate (Köppen: BWh) as the rest of Egypt, but its northernmost part, as is the case with the rest of the northern coast of Egypt which is the wettest region in the country, has relatively moderate temperatures, with highs usually not surpassing 31 °C (88 °F) in the summer. Only 100–200 mm (4–8 in) of rain falls on the delta area during an average year, and most of this falls in the winter months. The delta experiences its hottest temperatures in July and August, with a maximum average of 34 °C (93 °F). Winter temperatures are normally in the range of 9 °C (48 °F) at nights to 19 °C (66 °F) in the daytime. With cooler temperatures and some rain, the Nile Delta region becomes quite humid during the winter months. Furthermore, Egypt’s Mediterranean coastline is being swallowed up by the sea because of global warming and the rise of the sea level, and the lack of sediments being deposited since the construction of the Aswan Dam, in some places as much as 90 m (100 yd) a year. As the polar ice caps melt, much of the northern delta, including the ancient port city of Alexandria, will disappear under the Mediterranean. 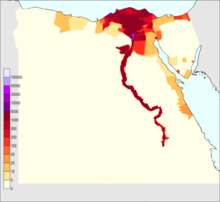 Even a 30 cm (12 in) rise in sea level will affect about 6.6% of the total land cover area in the Nile Delta region; At 1 m SLR, an estimated 887 thousand people will be at risk of flooding and displacement and about 100 km2 (40 sq mi) of vegetation, 16 km2 (10 sq mi) wetland, 402 km2 (160 sq mi) cropland, and 47 km2 (20 sq mi) of urban area land would be destroyed, flooding approximately 450 km2 (170 sq mi). The Nile Delta is turning into a salty wasteland by rising sea waters, forcing some farmers off their lands and others to import sand in a desperate bid to turn back the tide. Experts warn that global warming will have a major effect in the delta on agriculture resources, tourism and human migration besides shaking the region's fragile ecosystems. Environmental damage to the Nile Delta is not yet one of Egypt's priorities, but experts say if the situation continues to deteriorate, it will trigger massive food shortages which could turn seven million people into "climate refugees" by the end of the century if climate change remains unmitigated. In addition to the effect that the dams on the Nile have had on the delta, there has been a tremendous human effect internally with the rise of fisheries, the increased salt production, the building of roads, the heightened agricultural production, and the natural increase in human population in the region. ^ Zeidan, Bakenaz. (2006). The Nile Delta in a global vision. Sharm El-Sheikh. ^ a b Hasan, Emad; Khan, Sadiq Ibrahim; Hong, Yang (2015). "Investigation of potential sea level rise impact on the Nile Delta, Egypt using digital elevation models". Environmental Monitoring and Assessment. 187 (10): 649. doi:10.1007/s10661-015-4868-9. PMID 26410824. ^ a b John Cooper (30 September 2014). The Medieval Nile: Route, Navigation, and Landscape in Islamic Egypt. The American University in Cairo Press. p. 76. ISBN 978-977-416-614-3. ^ Holz, Robert K (1969). 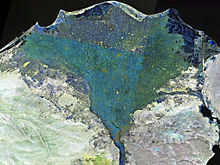 Man-made landforms in the Nile delta. American Geographical Society. OCLC 38826202. ^ Wilson, Ian. The Exodus Enigma (1985), page 46. London: Weidenfeld & Nicolson. ^ e.g. at Callisthenes Alexander 1.31. ^ e.g. in Ptolemy, Geography. ^ Hayes, W. 'Most Ancient Egypt', p. 87, JNES, 23 (1964), 73-114. ^ Location of the site, Kafr Hassan Dawood On-Line, with a map of early sites of the delta. ^ City Population website, citing Central Agency for Public Mobilisation and Statistics Egypt (web), accessed 11 April 1908. ^ "Cyperus papyrus". The IUCN Red List of Threatened Species. Retrieved 14 September 2018. ^ "Global Warming Threatens Egypt's Coastlines and the Nile Delta". Archived from the original on 29 September 2011. ^ "Egypt's Nile Delta falls prey to climate change". ^ "Egypt fertile Nile Delta falls prey to climate change". Archived from the original on 9 February 2011. ^ El Banna, Mahmoud M.; Frihy, Omran E. (2009). "Human-induced changes in the geomorphology of the northeastern coast of the Nile delta, Egypt". Geomorphology. 107 (1): 72–78. Bibcode:2009Geomo.107...72E. doi:10.1016/j.geomorph.2007.06.025. "Nile Delta flooded savanna". Terrestrial Ecoregions. World Wildlife Fund. "The Nile Under Control"[dead link] — 1937 article on controlling the flow of the Nile. This page was last edited on 5 April 2019, at 12:54 (UTC).